Looking for a Mobile Legends alternative? Try Heroes Evolved, a twist of DOTA 2 and League of Legends. 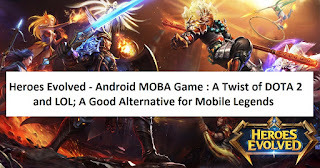 A fast-paced Android MOBA Game similar to Mobile Legends. Heroes Evolved is an android MOBA game by r2games and one of the fastest MOBA game gaining popularity in the Philippines. 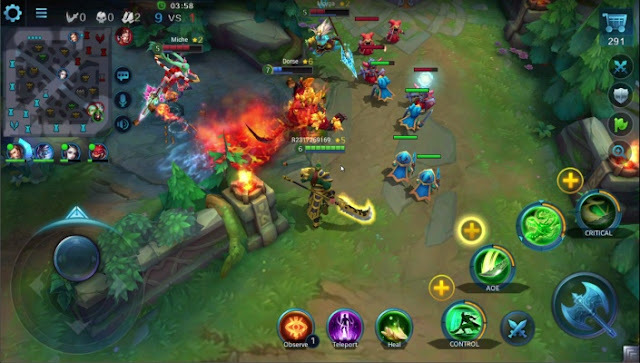 Just like Mobile Legends, Heroes Evolved has also a fair gameplay that you need to unleash your MOBA strategy and skills in order to achieve victory. When it comes in glyphs, Mobile Legends and Heroes evolved have gem system which originates from League of Legends' Rune System or Mastery System. * The river in the middle and the elevated base are from DOTA 2, which enables fog when you're in that area. * The walls, environment, minions, and graphics are from League of Legends. The connection of the game seems to be stable. I don't experienced any disconnection or sudden lag. So I'm pretty sure you will also like this game because it will give you an assurance of a smooth gameplay rather than a stressful gameplay. The games modes were just like League of Legends. The Heroes Evolved Tri-lane map has 'Altar of Strife' while LoL has 'Summoner's Rift'. And the other game mode is Mid-only map, Heroes of Evolved has 'Valley of War' while LoL has 'Howling Abyss' or known as ARAM (All Random All Mid) map. ● Custom gear builds - Pick your favorite items & create unique pahlawan loadouts. You can visit Heroes Evolved : Android Version or PC Version to play the game. After installing, you can connect to ANGKOR SERVER which is a South East Asian-based server which perfectly suits for SEA countries including Philippines. Majority of the players from ANGKOR SERVER are Filipinos, Thailand, Malaysian and Indonesians. Team-up with others players and start your Heroes Evolved adventure. And visit PinoyTechSaga daily to know latest Game News and Game Reviews.